Following a sellout exhibition at the Bode Museum in Berlin, "Renaissance Portraits" has moved to the Metropolitan Museum of Art in New York. Alessandra Quattrocchi survived the queues to take in an amazing collection. Here she explores the glorious origins of Italian portraiture. Are you planning a trip to Manhattan? You should really find the time to visit a truly splendid exhibition at the Metropolitan Museum, that opened on 21 December (if you’re planning to visit Manhattan in less freezing weather, it will be on show until 18 March 2012). The exhibition has come straight from Berlin, where it was on show at the Bode Museum until last November. The Berlin version was called simply Gesichter der Renaissance: Renaissance Faces. 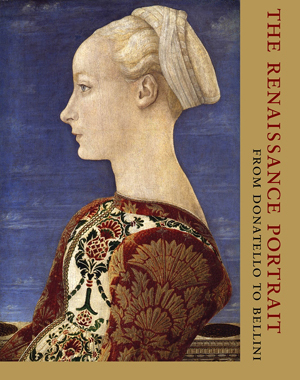 The New York title is The Renaissance Portrait from Donatello to Bellini, certainly descriptive but less alluring. The exhibition is fascinating, because those faces, staring at us from a Renaissance past, are the stories of people we can understand and dream about, even when we do not know their names. It is the greatness of the art of portrait painting in that it reminds us that we are all equal in the eyes of history, all mortals, all humans, and – technology apart – not really much changed since the dawn of time. Technology is the sign of our times, but it could have been put to better use by the Bode Museum in Berlin. The administration had allotted a quota of tickets which could be booked on the Internet, but they were sold out even before the exhibition opened. If you had not booked you could still get in, by buying the ticket on the day of your visit – a sadistic trial involving hours of queuing in the open air, in the freezing November weather, before the box office opened – and then being at the door at the time indicated for your ticket by electronic boards (which could be hours later). But then, at the Bode spaces are small; the Metropolitan Museum has room enough to accommodate throngs of people without any inconvenience. Unfortunately, the centerpiece of the Berlin exhibition, which caused such a stir at the Bode, is not on show in New York. 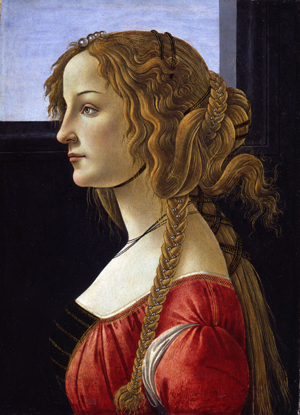 Leonardo’s Lady with the Ermine travelled to London instead, where you can see it until 5 February 2012. And it’s worth the trip too, because it is normally in a museum in Krakow and you won’t often get the chance to see it. Go to the National Gallery for the exhibition Leonardo da Vinci – Painter at the court of Milan where the Lady is shown together with other paintings executed under the patronage of Ludovico Sforza (La Belle Ferronière from the Musée du Louvre in Paris, the Madonna Litta from the Hermitage in Saint Petersburg and Saint Jerome from the Pinacoteca Vaticana in Rome, plus a ‘near-contemporary, full scale copy’ of Leonardo’s famous Last Supper, in the sanctuary of Santa Maria delle Grazie in Milan, very famous but badly ruined by the rigours of time). However, even without the Leonardo and its fascinating young model (more of which later) the portrait exhibition in New York is really worth the effort. Here’s why. The art of portrait painting flourished in the rich city-states of the Italian Renaissance where powerful lords like the Medicis in Florence, the Este family from Ferrara, the Sforzas from Milan and the Doges in Venice wanted to exalt (and legitimise) their position and emphasize their wealth. Some were warriors, many were sons of bankers and merchants rather than noblemen. Thus the art of portrait is almost intrinsically linked to the birth of a bourgeois class (it marked, for instance, the expansion of the middle class in Flanders and later in England). Those commissioning the portraits had to be wealthy, they had to be looking for reassurance of their status in society, and they had to love the arts. Not all were such refined scholars as Lorenzo de Medici, but they all knew enough to understand that social status comes through culture and works of art. But the most interesting thing about the portraits of the Italian Renaissance – that is, paintings from the 15th century and the beginning of the 16th – is that they were the first non-religious outlet for the creativity of the talented painters living at court. From the masterpieces of Antonello da Messina (whose resplendent colours have prompted critics to think he may have spent time among Flemish artists), the delicate touch of Raphael to the distinctive details of Piero della Francesca; these were artists hungry for a way of expressing themselves outside the constraints of ecclesiastical painting and Biblical allegories. Their first and foremost interest – as befitted the Renaissance climate – was mankind in all its facets. These artists did not only paint the great and the good; they spent considerable time painting people whose names will never be known. They also painted landscapes in exquisite detail (sometimes creating imaginary worlds to make fantasy lovers pant with desire) as a background to religious paintings: and what marvels of nature and perspective we find in the works of Piero Della Francesca or Filippino Lippi or Perugino. But in the Renaissance art of portrait painting we also have the love of everything human; young coquettish women, hopeful young bucks, rich merchants, powerful old men, old women with the sadness of lives unknown. Many of them also served as models in the religious paintings (how many Madonnas were frisky women of the people…), but it is when we see them in their everyday garb that they melt our heart. Under the painter’s brush every nuance of human behaviour is depicted. Then, of course, there is the thrill of actually looking in the face of people we’ve heard about – from Lorenzo de Medici to the incredible Popes painted by Titian, or the collectively horrendous Spanish royal family that Francisco de Goya managed to paint so exactly and unflatteringly, centuries later. But back to the Italian courts. As the Metropolitan Museum website observes, “during the early Renaissance, artists working in Florence, Venice, and the courts of Italy created magnificent portrayals of the people around them — from heads of state and church to patrons, scholars, poets, and artists — concentrating for the first time on producing recognizable likenesses and expressions of personality”. Indeed. “Featuring many rare international loans, this exhibition will present an unprecedented survey of the period and provide new research and insight into the early history of portraiture. It is divided into three sections and spans a period of eight decades. Beginning in Florence, where independent portraits first appeared in abundance, it moves to the courts of Ferrara, Mantua, Bologna, Milan, Urbino, Naples and papal Rome, and ends in Venice, where a tradition of portraiture asserted itself surprisingly late in the century”. The exhibition features portraits by Masaccio, Antonello da Messina, Piero della Francesca, Pisanello, Pollaiolo, Giovanni Bellini, Fra’ Angelico, Filippino Lippi, Botticelli and Ghirlandaio among others. It is incredible that this wonderful show of Italian richness is not going on show in Italy. The joint venture by the Bode Museum and the Metropolitan is a German-American partnership. There are about thirty drawings, medallions and paintings actually coming from Italian museums but the bulk of the exhibition comes from German and American museums. For instance, while the Uffizi in Florence gave three paintings, they did not send the wonderful portraits that Piero della Francesca made of Federico da Montefeltro, the Duke of Urbino, and his wife. And while the Louvre (which hosts an impressive collection of Renaissance Italian paintings) gave about fifteen pieces, it did not give the magical portrait painted by Raphael of the great Florentine courtesan, Baldassarre Castiglione. The disappearance of so much Italian art from Italian museums is a sore point with many Italians. One may argue that there is still more than enough art in Italy and that anyway other museums in the world are better equipped to protect and enhance such treasures. It is galling, however, to realise that the greatest part of Leonardo’s masterpieces have found their way out of Italy. The portrait of Ginevra de’ Benci is in the Washington National Gallery of Art. The Mona Lisa is, famously, in the Louvre; legitimately so, however, since Leonardo himself brought it as a gift to French king Francis I when he crossed the Alps, eventually dying in the king’s castle in Amboise in 1519, revered and coddled. But what of the Lady with the Ermine, this most exquisite portrait? Painted in 1484, together with the Mona Lisa (1503-06) and the Ginevra de’ Benci (painted in Florence in 1474), it had a profound impact on the evolution of European portraiture. The painting – property of the private Czartoyski museum in Krakow, founded by Princess Izabela Czartoyska – underwent several modifications over the years (somebody tweaked Cecilia’s hair and veil, and somebody else painted the whole background in black; rumour has it was the great Eugéne Delacroix). While the more ancient and formal of the portraits are profiles, painters later started using a three-quarter stance that gave their models a greater liveliness. The young lady of the portrait, however, is shown in a three-quarter pose, but her head is turned the other way, looking not at the painter, but outside the frame, an entirely new movement that leaves us wondering who she was looking at. And we think we know. This painting portrays the young Cecilia Gallerani, daughter of an impoverished noble family, and mistress of the Duke of Milan, Ludovico Sforza, also known as Ludovico il Moro. She was at court in 1490, when the Ambassador from Ferrara, Giacomo Trotti, wrote home to his seigneur D’Este that Ludovico was said to be sick “dal troppo coito di una sua puta che prese presso di sé, molto bella, parecchi dì fa, la quale gli va dietro dappertutto, e le vuole tutto il suo ben e gliene fa ogni dimostrazione”: in short, he had coupled too much with a very beautiful young lady he had taken at court. “Puta” was meant as “child”: Cecilia was then but 16. Trotta had his reasons to be worried: Ludovico was engaged to be married to Beatrice D’Este. Her portrait is an icon of its time: because Cecilia must have been a fantastic woman and she may have disappeared into the black night of history if the enamored Ludovico had not asked his star painter to immortalise her. Her family came from Siena and they had sought refuge in Milan from civil war fighting in Tuscany. Fazio Gallerani, father of Cecilia, was a high official in the Duke’s court. In 1473 Cecilia was born, last but one of nine siblings. She was a child when her father died; and her arranged marriage to Stefano Visconti was cancelled in 1487, probably because the family could not afford her dowry. But Cecilia by then was already making her way into the world. Her mother Margherita came from a family of scholars and the children were all highly accomplished. In 1489, Cecilia signed, along with her siblings, a petition to the Duke asking to regain possession of the land sequestered to pay her father’s debts. It was probably around that time that the Duke noticed her. In the document, Cecilia is registered as living independently in Milan while her brothers were at home; an improbable arrangement for a sixteen-year-old girl. That same year, the Duke asked Leonardo to paint her. 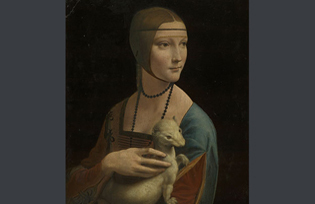 In the portrait, she sits petting an ermine (perhaps modelled on a ferret, since ermines were not frequently seen in Northern Italy), a symbol of purity but also part of the Sforza’s coat of arms. We can imagine Ludovico entering the room and the young spirited woman turning to glance at her love. Cecilia spoke Latin fluently and loved music and writing; she undoubtedly formed a friendship with Leonardo during the long hours of sitting. Her life at court lasted a few years: she had a child with the Duke, who kept her at the castle even after he married Beatrice D’Este in 1491 (the ever present Ambassador Trotta wrote home that the Duke complained his wife did not want to fulfil her conjugal duties, and this was the reason why he kept meeting Cecilia). Thus the young Gallerani remained at court for a time and other letters bear witness to the fact that the Duke was still very much taken with her. She finally left, showered with presents – including the portrait that she took with her – for a handsome palace in via Broletto, and a husband, Count Ludovico Carminati whom she married in 1491. In their villa “Il Bergamino” near Cremona (today it is called Villa Medici del Vascello) she held one of the first literary salons on record, that assembled artists, poets and writers. In 1498, Isabella d’Este, marquise of Mantua and sister of Beatrice, who had remained Cecilia’s friend, wrote to ask her if she could see the Leonardo portrait to compare it with some paintings by Giovanni Bellini. Cecilia wrote back that she would send the portrait, although it was a likeness of her youth, no longer resembling her. But she jumps out of the frame to meet us, this vibrant smart young woman Leonardo painted for all future generations to see; a monument to the art of portrait and its intricate relationship with the human soul.